This midgame tank excells at close combat. With the ‘Thunder Hammer’ and the ‘Shockwave’ it is able to deal a huge amount of burst damage at short range. To close the gap to the opponent use mobility items, especially a teleporter should be bought soon after the tank has been chosen. The Goblin Tank is especially strong in 1vs1 situations, or as a cleanup tank to finish of low-hp tanks in teamfights. Hint: Use a ‘Net Launcher’ on air tanks before using ‘Thunder Hammer’ on them. 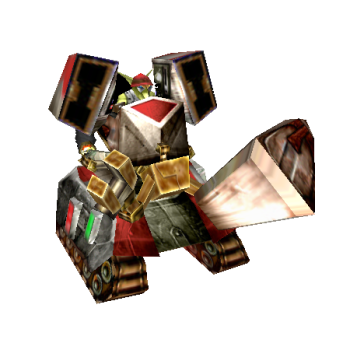 The Goblin Tank accelerates by 50 % when the target is in a range of 1250 and tries to attack with a giant hammer. Stuns the target and deals huge damage. Netted Air Tanks can be targeted as ground Units as well. Produce one or more Goblin Riots, which cannot be attacked, however after 5 seconds, they blow up themselves and cause up to 450 damage. Also damages allies for half the damage. 1 10 40 sec. - - Summons 1 Goblin Riot. 2 20 35 sec. - - Summons 2 Goblin Riot. 3 30 30 sec. - - Summons 3 Goblin Riot. 4 40 25 sec. - - Summons 4 Goblin Riot. 5 50 20 sec. - - Summons 5 Goblin Riot. Summonings will target/move-to nearby enemy units on their own accord. ‘Goblin-Riot’ can be used as a safe way to farm creeps, but summonings may also be quickly selected and controlled to siege turrets. Increases the vehicle’s speed and reduces magical damage ( tank skills and weapons ). 1 - - - - Increases Speed by 2%, reduces magical damage by 3%. 2 - - - - Increases Speed by 4%, reduces magical damage by 6%. 3 - - - - Increases Speed by 6%, reduces magical damage by 9%. 4 - - - - Increases Speed by 8%, reduces magical damage by 12%. 5 - - - - Increases Speed by 10%, reduces magical damage by 15%. Causes a bright shockwave around the Goblin Tank, which deals damage to nearby enemy units.